Lead Levels Are Forcing More Than 1,000 Indiana Residents To Relocate : The Two-Way The residents of a public housing complex in East Chicago, Ind., are now forced to move because of dangerously high lead levels in the area's soil. A lead smelting company used to lie on the site. A sign from the Environmental Protection Agency posted in front of West Calumet Housing Complex houses in East Chicago, Ind. 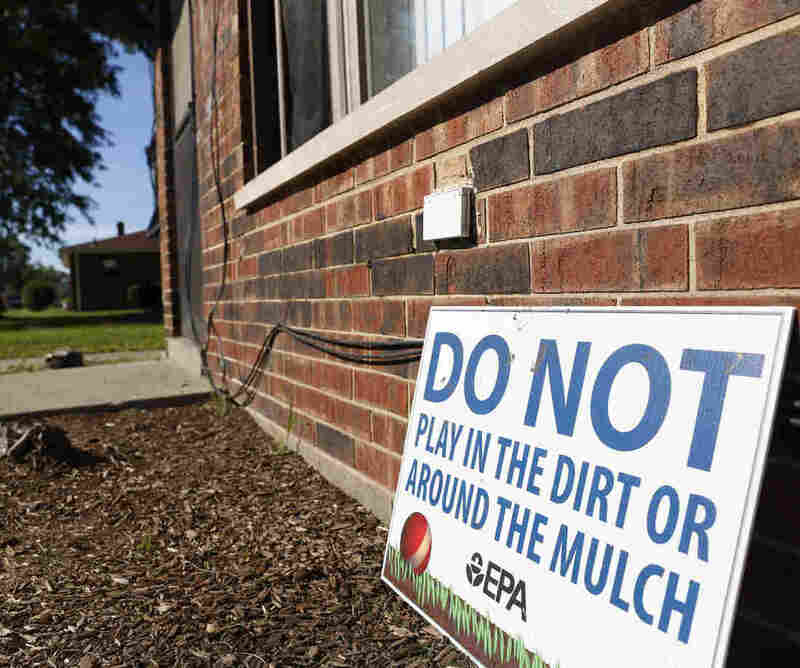 More than 1,000 residents of a public housing complex in East Chicago, Ind., are now forced to relocate because of dangerously high lead levels in the area's soil. The West Calumet Housing Complex, which houses primarily low-income families, lies on the site of a former lead smelting company, as member station WBEZ reported. In July, the Environmental Protection Agency reported high lead levels in the soil in parts of the complex and notified the residents. The EPA advised parents to stop their kids from playing in the dirt, "to wash their children's toys regularly and to wash children's hands after they play outside." As WBEZ reported, the samples showed lead levels "three times higher than the federal safety standards and in some places even higher, much higher." After that, East Chicago Mayor Anthony Copeland "ordered the removal of 1,200 residents from the West Calumet housing project for safety concerns," according to the member station. The residents have now been informed that the 346-unit complex is set to be demolished. "Residents have been provided vouchers for temporary hotel living until their homes are done being cleaned. The residents will return to their homes for a few more months until vouchers for permanent housing are made available by the U.S. Department of Housing and Urban Development." Those vouchers will allow residents "to relocate to any public housing complex in the U.S.," as WBEZ reported. That process will take months to complete, and there's a lot of confusion about how it will work. 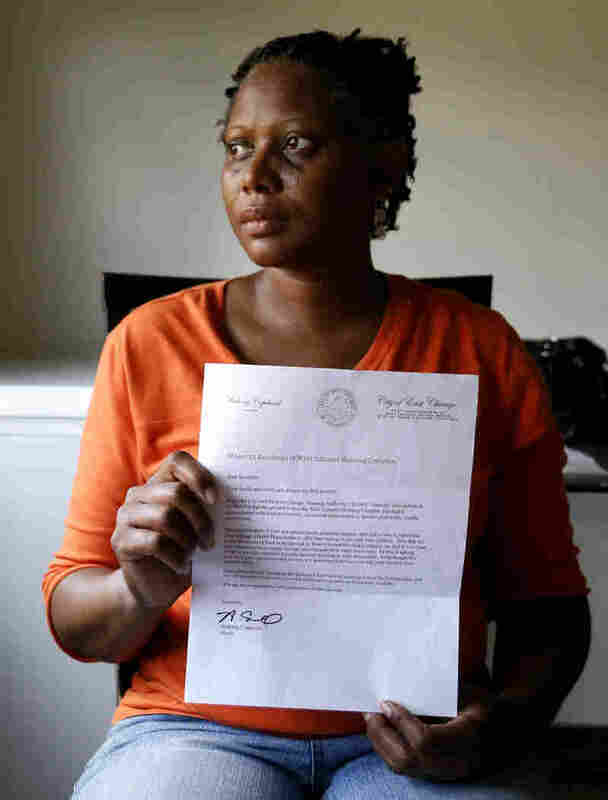 Residents told The Northwest Indiana Times that they have received "misleading and confusing information about how much moving assistance is available." Among the unanswered questions: whether the residents will receive help with costs like "moving transportation and security deposits." Also unclear: "when the initial security deposits they paid to move to West Calumet will be returned," according to the newspaper. Wednesday, Here and Now spoke with community volunteer Juan Fernandez, a former resident of the West Calumet Housing Complex, who is distributing kits full of moving supplies such as boxes and tape to the residents scrambling to relocate. He said he lived there from 1995 to 1999, after his father was laid off. He described it as a "tight-knit community" where children regularly played outside. Robert Kaplan, the EPA's acting administrator for the Great Lakes Region, told The New York Times that the agency "had in fact warned West Calumet residents for at least a decade to avoid the soil with public notices and community meetings." But growing up there, Fernandez said, he never saw notices. "If someone knew about that then, I know definitely my dad wouldn't have allowed his family to move into a contaminated area," he told the show. That sentiment is echoed by area resident Maritza Lopez. "It's just shocking that overnight to find out these levels are this high. They haven't even touched testing the people from these areas or the children," Lopez told WBEZ. "There's a lot of questions that need to be answered, and nobody is answering them for us." The EPA is coming under fire for its response to the lead levels. In a letter to Kaplan dated June 16, 2016, and released through The Northwest Indiana Times, Copeland said the EPA was slow to respond to early indications of high lead levels and then was slow to release the information to city officials and the public. He said the agency's proposed solution at the time, digging out and removing the contaminated soil, was insufficient and potentially dangerous. "[W]e feel that it is impossible for the EPA to provide assurances that human health will not be harmed as it performs this cleanup with residents remaining in place," Copeland's letter stated. "It is unconscionable that the EPA intends to allow American families and children to continue to live and play in yards where the concentration of lead in the dirt far exceeds the concentration of lead in lead paint, while it digs up such soil throughout the neighborhood, with insufficient protection provided to these residents." Kaplan has maintained the EPA plan was safe, according to the Times, but said "we respect the mayor saying he wants to go a different way." Lead is especially harmful for children — and "even relatively low levels of exposure can cause serious and in some cases irreversible neurological damage," according to the World Health Organization. The issue of lead has gained renewed national focus in light of the unfolding lead crisis in Flint, Mich.